Yesterday Amy and I adopted a young black male cat from the SPCA. We had been talking about getting a cat for a while, and while we were out yesterday decided to go have a look. They had quite a few cats available, and we both quite liked the look of a small grey female with a very distinguished narrow face. 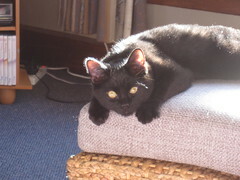 However, this black one seemed much friendlier and purred a lot. It was a toss-up for a while but we were both won over by the black one. We had just finished watching the movie "How to Train Your Dragon", which features a rather feline black dragon named "Toothless". That would be a fitting name for a black cat, we thought. While we were doing the paperwork, they noted that he was due for his deworming pill, so they gave him the pill right there. But while he was taking the pill, we noticed one of his teeth didn't look right. Sure enough, it was askew and fell out in Amy's hand! They suspected that it may have been like that for a while and that he would be fine without it. We realised right then that the name "Toothless" would stick. He's very friendly and purrs almost continuously when sitting near us (right now I'm slouching on the futon with my laptop propped up on my knees, with Toothless sitting on my chest purring). He knows where his food and litter box is, but we're definitely going to have to get him a scratching post to save our furniture. For now he's got full reign over the living room and kitchen, and we'll introduce him to the rest of the house in time. Ultimately he will be an outdoor cat too, because we regularly leave windows and doors open to let the air through the house. Hopefully he won't get too tangled up with the other cats in the neighbourhood (of course he's been fixed).